This name uses Eastern Slavic naming customs; the patronymic is Pavlovna. Anna Pavlovna of Russia (Russian : Анна Павловна; Dutch: Anna Paulowna; 18 January 1795 [OS 7 January] — 1 March 1865) was a queen consort of the Netherlands. Grand Duchess Anna Pavlovna of Russia, circa 1813. The Great Gatchina Palace is a palace in Gatchina, Leningrad Oblast, Russia. It was built from 1766 to 1781 by Antonio Rinaldi for Count Grigori Grigoryevich Orlov, who was a favourite of Catherine the Great, in Gatchina, a suburb of the royal capital Saint Petersburg. The Gatchina Palace combines classical architecture and themes of a medieval castle with ornate interiors typical of Russian classicism, located on a hill in central Gatchina next to Lake Serebryany. The Gatchina Palace became one of the favourite residences of the Russian Imperial Family, and during the 19th century was an important site of Russian politics. Since the February Revolution in 1917 it has been a museum and public park, and received UNESCO World Heritage Site status in 1990. Maria Feodorovna was Empress consort of Russia as the second wife of Tsar Paul I.
Anna Pavlovna of Russia, between 1824 and 1825. On 21 February 1816 at the Chapel of the Winter Palace in St Petersburg, she married the Prince of Orange, who would later become King William II of the Netherlands. The marriage had been suggested by her brother the Tsar Alexander I in 1815, as a symbol of the alliance created after the Congress of Vienna. As it had been decided that no member of the Romanov family should be forced to marry against their will, William was invited to Russia before the wedding so that Anna could get to know him and consent to marry him, which she did. 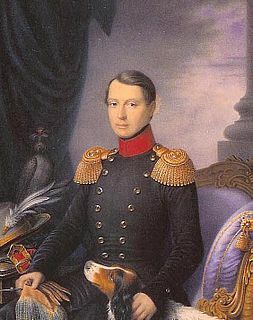 At the time of their marriage, it was agreed that Prince Willem's children should be raised as Protestants, although Anna herself remained Russian Orthodox. Alexander Pushkin celebrated the marriage in a special poem entitled To the Prince of Orange. The couple remained in Russia for one year. The Grand Church of the Winter Palace in Saint Petersburg, sometimes referred to as the Winter Palace's cathedral, was consecrated in 1763. It is located on the piano nobile in the eastern wing of the Winter Palace, and is the larger, and principal, of two churches within the Palace. A smaller, more private church was constructed in 1768, near the private apartment in the northwest part of the wing. The Grand Church was designed by Francesco Rastrelli, and has been described as "one of the most splendid rooms" in the Palace. Today, the church is an unconsecrated exhibition hall of the State Hermitage Museum. The Winter Palace was the official residence of the Russian Emperors from 1732 to 1917. Today, the palace and its precincts form the Hermitage Museum. Situated between Palace Embankment and Palace Square, in Saint Petersburg, adjacent to the site of Peter the Great's original Winter Palace, the present and fourth Winter Palace was built and altered almost continuously between the late 1730s and 1837, when it was severely damaged by fire and immediately rebuilt. The storming of the palace in 1917, as depicted in Soviet paintings and Sergei Eisenstein's 1927 film October, became an iconic symbol of the Russian Revolution. Anna Pavlovna was shocked over the differences between Russia and her new home country, especially when it came to the class system and the separation between the classes, which was much less strict in the Netherlands, where the distance between royalty and the public was not as great as in Russia, and she had difficulties adjusting herself to this. The couple lived in Brussels until the Belgian revolution forced them to leave in 1830. Anna liked Brussels much more than the North, as it reminded her more of her native country. She founded a school where poor women and girls were educated in sewing (1832), and a hospital for soldiers wounded in the Belgian revolution (1830). On 7 October 1840, on the abdication of her father-in-law, William I of the Netherlands, she became queen consort of the Netherlands. She became the 343rd Dame of the Royal Order of Queen Maria Luisa on 1 February 1842. As a queen, Anna is described as dignified, arrogant and distant towards the public. She did in fact learn to speak better Dutch than her often French-speaking spouse, but she upheld a strict etiquette and never became very popular as queen. She valued pomp, etiquette and formal ceremonies and rituals. Anna Pavlovna corresponded with her mother and brothers in Russia and treasured the memory of her birth country: she founded a Russian boys' choir, where the members were to be dressed in traditional Russian costume, and it has been said of her that she remained a Russian Grand Duchess more than she ever became Queen of the Netherlands. As a queen dowager, Anna left the royal palace, retired from court life and lived a discreet life. She did not get along with her daughter-in-law, Sophie, who was the daughter of her sister, Catherine, as she was allegedly jealous of Catherine's beauty and status as their mother's favourite child. She had plans to return to Russia after a conflict with her son, King William III, in 1855, but in the end, she did not. William Alexander Frederick Constantine Nicholas Michael "Sasha" of the Netherlands (1818–1848). 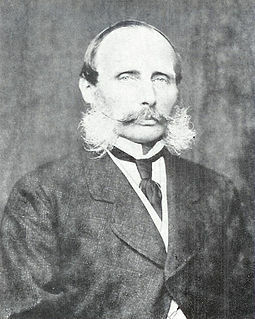 William Frederick Henry "the Navigator" of the Netherlands (1820–1879). Married firstly Amalia of Saxe-Weimar-Eisenach and secondly Marie of Prussia, but had no issue. Prince William Alexander Ernst Frederick Casimir of the Netherlands Dutch: Willem Alexander Ernst Frederik Casimir (Brussels (per one source) or Soestdijk Palace (per another), 21 May 1822 – Brussels, 22 October 1822). Wilhelmina Marie Sophie Louise of the Netherlands (1824–1897). Married Karl Alexander, Grand Duke of Saxe-Weimar-Eisenach. The municipality Anna Paulowna in the Dutch province of Noord Holland is named after her. Friedrich Eugen, Duke of Württemberg, was the fourth son of Karl Alexander, Duke of Württemberg, and Princess Maria Augusta of Thurn and Taxis. He was born in Stuttgart. From 1795 until 1797 he was Duke of Württemberg. Grand Duchess Maria Pavlovna of Russia was the third daughter of Paul I of Russia and Sophie Dorothea of Württemberg. She was the Grand Duchess of Saxe-Weimar-Eisenach by her marriage to Charles Frederick, Grand Duke of Saxe-Weimar-Eisenach. Grand Duchess Elena of Russia, Hereditary Grand Duchess of Mecklenburg was a daughter of Grand Duke, later Tsar Paul I of Russia and his second wife Sophie Dorothea of Württemberg. After marrying the son and heir of the Grand Duke of Mecklenburg-Schwerin she ceased to use her Russian title. Princess Marie of Saxe-Weimar-Eisenach was a princess of Saxe-Weimar-Eisenach, by birth, and, by marriage, a princess of Prussia. She was the daughter of Charles Frederick, Grand Duke of Saxe-Weimar-Eisenach and Grand Duchess Maria Pavlovna of Russia. 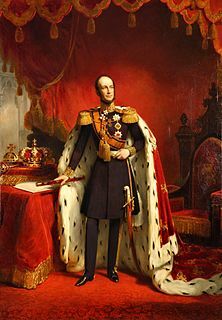 Charles Alexander was the ruler of Saxe-Weimar-Eisenach as its grand duke from 1853 until his death. Princess Caroline Augusta of Bavaria was an Empress consort of Austria by marriage to Francis I of Austria. She was a daughter of King Maximilian I Joseph of Bavaria and Princess Augusta Wilhelmine of Hesse-Darmstadt. She married Crown Prince William of Württemberg, whom she divorced, and Emperor Francis I of Austria. Princess Charlotte of Württemberg was later known as Grand Duchess Elena Pavlovna, the wife of Grand Duke Michael Pavlovich of Russia. He was the youngest son of Emperor Paul I of Russia and Duchess Sophie Dorothea of Württemberg. Princess Sophie of the Netherlands was the only daughter and last surviving child of King William II of the Netherlands and of his wife Grand Duchess Anna Pavlovna of Russia. She was heir presumptive to her niece, Queen Wilhelmina of the Netherlands, for seven years, from the death of her brother until her own death. Princess Caroline Louise of Saxe-Weimar-Eisenach was a princess of Mecklenburg-Schwerin by virtue of her marriage. She was the daughter of Charles Augustus, Grand Duke of Saxe-Weimar-Eisenach and his wife Louisa of Hesse-Darmstadt. 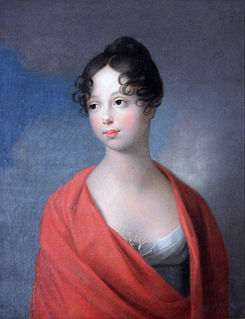 Friederike of Brandenburg-Schwedt was Duchess of Württemberg by marriage to Frederick II Eugene, Duke of Württemberg. She is an ancestor to many European royals of the 19th and 20th century. Prince Ernest Casimir of the Netherlands, Prince of Orange-Nassau was the fourth son of the Prince of Orange, later King William II of the Netherlands and his wife Grand Duchess Anna Pavlovna of Russia. Princess Ida Caroline of Saxe-Meiningen, was a German princess, a member of the House of Wettin, and by marriage Princess of Saxe-Weimar-Eisenach. Princess Sophie Louise of Saxe-Weimar-Eisenach was a princess of the House of Saxe-Weimar-Eisenach. She was born in Weimar, the eldest child and only daughter of William Ernest, Grand Duke of Saxe-Weimar-Eisenach by his second wife Princess Feodora of Saxe-Meiningen. 1 2 3 "Anna Pavlovna – Hermitage Amsterdam". hermitage.nl. 1 2 3 Kenneth. "Grand Duchess Anna Pavlovna". rusartnet.com.